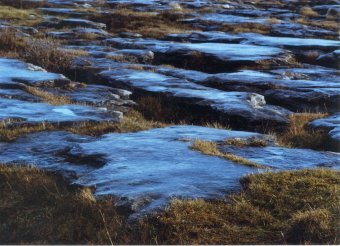 The name Burren comes from the Gaelic, it means 'a rocky place'. Historically the name Burren referred to the Barony of Burren situated in north-west County Clare. Geographically, the name has a far wider and more complex sense and meaning. The Burren area extends some 40.2 km from east to west, and 32.2 km from north to south. It lies between Galway Bay on the north, the Atlantic coast on the west and a line drawn roughly through Doolin, Kilfenora, Gort and Kinvara. However, there is some characteristic 'Burren' outside this area to the east where one can find the same features, but perhaps not as frequently or as concentrated. The Burren is a gently sloping carboniferous limestone landscape, broadly dissected by numerous joints running north to south. It is the youngest landscape in Europe and has suffered intense glaciation, the last occurred as recently as about 10,000 years ago. In the Burren one can observe almost all the typical limestone landforms; underground rivers, swallow holes, glacial erratics, caves, clints, grykes and closed depressions (turloughs). This limestone is an organic sedimentary rock laid down millions of years ago in a shallow warm sea, it is the result of marine plants and animals dying and accumulating in horizontal beds on the sea floor. The limestones of the northern Burren are almost horizontal and dip only very gently to the south but in the south-eastern Burren the limestones are gently compressed into open folds, as is particularly well seen at Mullaghmore (627 ft). This mountain illustrates both anticlinal and synclinal folding and the way in which the two different fold types react to weathering and erosion. In the anticlinal, the joints have become expanded and the beds stretched, therefore erosive agents can enter the rocks more easily; whereas in the synclinal joints and the beds are compressed, and tighter, and rather squashed looking. At the foot of the mountain, there is a polje or closed depression, locally known as a turlough.